Best View in Brooklyn: Bay Ridge Food Coop Launch Party TONIGHT! 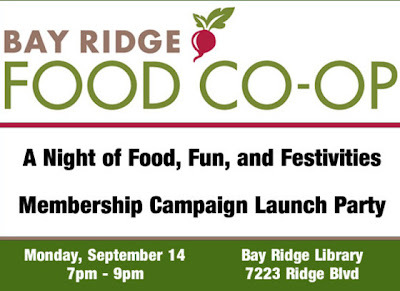 Bay Ridge Food Coop Launch Party TONIGHT! This idea has been in progress for a while, and I haven't been paying much attention on the BR message boards due to other concerns. Sorry about the last minute notice, but I only found this when cleaning out my spam folder. Thanks, Jim, for forwarding this to me! Register for the launch party here.